Published in Frontiers in Plant Science, their study shows that growing grasses alongside blueberry plants corrects signs of iron deficiency, with associated improvements in berry quantity and quality. The effects are comparable to those seen following standard chemical treatment—providing a simpler, safer, cheaper and more sustainable strategy for blueberry farming on sub-optimal soils. 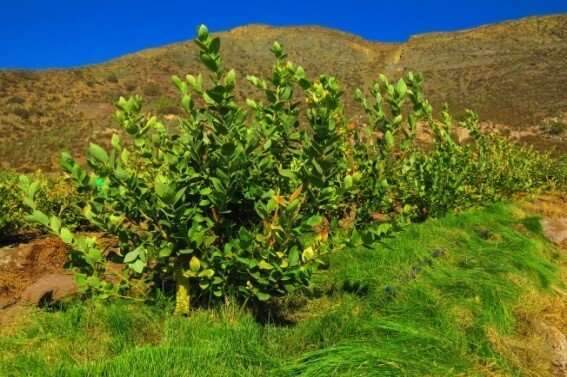 "Most plants get enough iron by secreting chemicals that make it more soluble," explains senior study author Dr. José Covarrubias, Assistant Professor of Agriculture Sciences at the University of Chile. "These iron 'chelators' can be released directly from the roots, or from microbes that grow among them, and allow the iron to be absorbed." "Iron is essential for the formation and function of plant molecules like chlorophyll that allow them to use energy," Covarrubias continues. "That's why iron deficiency shows up as yellowing leaves—and drastically reduces plant growth and yield. Strong blueberries must pump iron—but at what cost? "The commonest industrial approach is soil acidification using sulfur, which is gradually converted by soil bacteria into sulfuric acid. The effects are slow and difficult to adjust—and in waterlogged soils, hydrogen sulfide might accumulate and inhibit root growth. "Acids can also be added directly via irrigation systems for more rapid acidification—but these are hazardous to farmers, kill beneficial soil microbes, and generate carbon dioxide emissions. "A commoner strategy among growers is application of iron bound to synthetic chelators—often sold as 'ericaceous fertilizer' - but these are very expensive and leach potentially toxic chemicals into the water table." "Grasses—which are well-adapted to poor soils—can provide a sustainable, natural source of iron chelators via their roots when grown alongside fruiting plants. Intercropping with grass species has been shown to improve plant growth and fruit yield in olives, grapes, citrus varieties—and most recently, in blueberries." "We found the association with grasses increased not only the total weight and number of blueberries per plant, but also the concentration of anthocyanins and other antioxidant compounds in their skins, compared to control. The effect sizes were comparable with the proven synthetic chelator Fe-EDDHA, whereas applications of Fe-heme from cow's blood—a fertilizer commonly used in home gardens—had no significant effect." Intercropped plants also required an additional water supply to maintain a similar soil moisture to other treatments, but plant management was otherwise straightforward and the same across groups. The grasses were kept cropped between 5 and 15cm—a typical range for an attractive mown lawn.